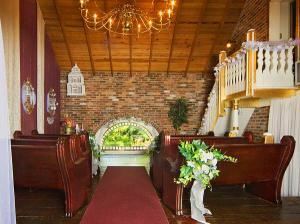 The Chapel and Tea Room are all set to make your day perfect and unique. The garden filled courtyards are "the"place for strolling and picture taking. Your memorable day begins here! For guests who need to host an event in Dubuque, the hotel offers 9,599 sq ft of meeting space comprised of eight rooms, including two ballrooms that each can accommodate 300. Four on-site event specialists and on-site catering options are available. With features that appeal to business travelers, event planners and leisure seekers, we strive to make sure every Best Western experience is a quality experience. With affordable yet comfortable accommodations, there’s no need to skimp on what you want because at our Best Western Plus Dubuque you can have it all. The Best Western Plus Dubuque Hotel & Conference Center is an ideal place to host all kinds of meetings and events. We present a unique newly remodeled variety of meeting rooms at our conference center from an exclusive 103-seat tiered Symposium Theater to our Executive Boardroom, accommodating up to 350 guests for conferences, receptions or speaker series.